Five decades after it was introduced to the Israeli market, beloved national treat Krembo is shedding its familiar aluminum foil. Unilever Israel, a local subsidiary of international consumer goods conglomerate Unilever PLC and producer of Krembo, announced Monday that beginning in September, Krembos sold in eight-unit packages will no longer be individually wrapped in their distinguishable foil. Israeli news site Ynet News first reported the story. 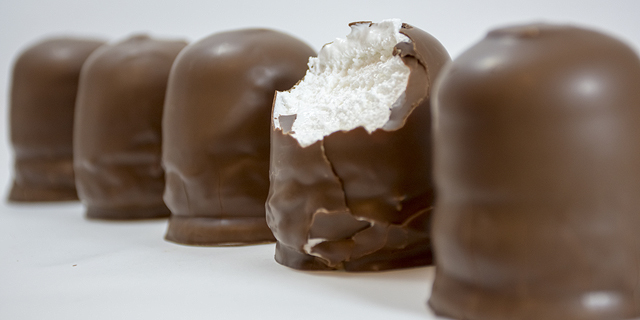 The Krembo is a palm-sized treat containing a biscuit base topped with a mound of firm egg foam and coated in chocolate. Krembo is said to be based on a similar treat developed in Denmark some 200 years ago and popularized throughout northern Europe. It bears a likeness to the American Mallomar and the U.K.’s Tunnock's Teacake. In Israel, the Krembo is one of few treats to have gained a cultural standing and has been referenced in literature, film, and popular music as a quintessential Israeli snack food. Krembos are marketed in Israel as a cold season treat, and their limited availability has been known to contribute to their sustained popularity. Israeli children often collected the shiny Krembo wrappers. According to Unilever, the goal of this move is to reduce the use of packaging materials and related costs. Eliminating the foil is set to save over 13 tons of aluminum annually, or 6,000 square kilometers of foil, nearly a third of the country’s surface. In addition to the cost of aluminum, Unilever is expected to save on countless man-hours, as each Krembo must be manually wrapped due to the treats’ fragility. Unilever said that the elimination of aluminum will allow the company to keep Krembo prices down despite what it described as a “dramatic erosion” in the product’s profitability. Earlier this month, the company announced it intends to raise the price of Krembos sold in 20-piece and 32-piece packs by 7.5%. Krembos sold in these larger packages are marketed to retailers and are often re-sold, requiring individual wrapping. Big Mistake. Apparently Unilever does not understand children. Part of the fun of eating a Krembo is unwrapping it. Kinder - imported from Germany goes a step further - they put a little present inside their cholalate egg. More likely 6 square kilometers.